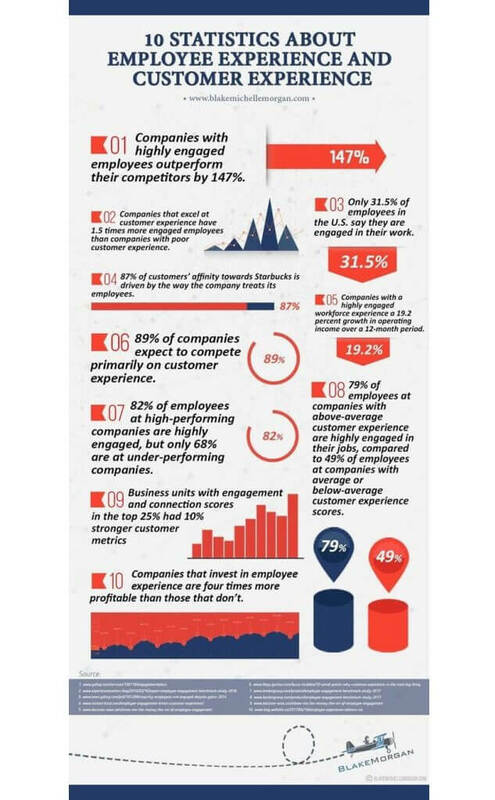 I ran across an infographic in a Forbes article recently, exploring the 10 stats linking employee experience to customer experience. It really is a thing, you know—employee experience impacts customer experience, in more ways than you might realize. When companies focus on creating culture and providing a great employee experience, it affects every aspect of the business, including the customer service employees deliver. And that’s the link between employee experience and customer experience. Research shows that great employee experience inevitably leads to great customer experience. Not only is that pretty much a no-brainer, it’s something that’s top of mind for many leaders these days. There are two things at play here. With the battle for top talent at an all time high, and with people staying at jobs for shorter periods of time, recruiting the best and the brightest and figuring out how to keep them around is top of mind for HR pros and senior leaders at companies of all sizes. In addition, finding prospects, turning them into customers, and keeping them happy and satisfied customers is what makes businesses grow and prosper. It only stands to reason that there’s a connection between the two, and that happy, satisfied employees lead to happy, satisfied customers. What Things are Linking Employee Experience to Customer Experience? So what are the things linking employee experience to customer experience? Good question. It’s not a stretch to say that employees spend more waking hours with their work colleagues than they do with their families. This isn’t anything new, it’s pretty much always been like that. At least that’s been my experience over the course of my career—how about you? Creating a culture of engaged, invested, and happy employees is part of what keeps a company vibrant, growing, and successful. Research backs that up, showing that companies with highly engaged employees outperform their competitors by 147%. Where does the research linking employee experience to customer experience come in? That’s simple—customer experience is a direct result of employee experience. Research shows that companies that excel at customer experience have 1.5 times more engaged employees than companies with a record of poor customer experience. It’s pretty clear, and it’s also just common sense, that the information linking employee experience to customer experience is irrefutable. It’s also clear that companies who invest in employee experience can see a higher ROI than those who don’t. How Do You Get Engaged Employees? So how do you get a culture of engaged employees? Well, actually, you don’t “get” engaged employees—companies earn that engagement. How do you earn that? By focusing on creating a corporate culture that literally feeds the souls of your employees. A culture that they feel an integral part of, a company culture that they are proud of, a culture that feels like the company values mirror their individual values. A company culture where employees feel respected, and trusted, and valued. All these things matter, and while it sounds like a no-brainer, making a commitment to creating this kind of culture isn’t inherently easy, especially for large organizations. So what are companies with a recognized culture of engaged employees? What comes to mind for you? JetBlue is one that comes immediately to mind. Consistently rated one of the best airlines in the world, JetBlue is known for its amazing culture. At JetBlue, employees are encouraged to go to great lengths to fulfill their customers’ needs. How? The company trusts and empowers its employees, and affords them the freedom to solve customers problems as if they were their own. They have ownership of the relationship with the customer, and they are empowered to solve customer problems and, thereby, create great customer experiences. Speaking of airlines, Southwest Airlines is another company known for its great culture. and for linking employee experience to customer experience. Employees are outgoing, friendly, empowered, and work hard to make every experience that customers have with the airline a good one. That’s why I’ve been a customer for so long—I love how they treat their employees, and I how those engaged, empowered employees treat their customers. Costco is yet another example. The second biggest retailer in the world, Costco has a well-established reputation for a company with a great corporate culture. I’ve yet to be in a Costco, anywhere in the U.S., where employees aren’t friendly, courteous, and striving to make sure the customer experience is a good one. Why? Because Costco has created a culture wherein they take care of their employees. In fact, Costco was named the top place to work in 2017, knocking Google out of the number one spot. Why is the Costco culture and employee experience so great? It’s probably a twofold answer. First, the company vision is that the organization helps people make ends meet, helps businesses be more efficient, and serve customers better—and the company is committed to being a positive force in the communities where it has a presence. Secondly, the values of the company are simply defined: “Always do the right thing, even when it hurts.” The company treats its employees like family, and the feeling they have, and the pride they take in working for the company shows in the way they treat customers. Starbucks is yet another example of companies linking employee experience to customer experience. The company prides itself on taking care of its employees through initiatives such as stock options, competitive wages, education reimbursements, quality training, and health benefits. Starbucks knows that by keeping employees happy, they can help keep their customers happy too. How? Happy employees naturally and instinctively create a welcoming atmosphere and provide a blue ribbon customer experience. Let me ask you a question: Have you ever gotten really terrible customer service at a Starbucks? I generally find their team to be friendly, cheerful, and even when incredibly busy, genuinely interested in providing good service. A tidbit from the infographic, customers report that some 87 percent of their affinity toward the Starbucks’ brand is driven by the way the company treats its employees. In short, people like the company because they like the way it treats its employees. And that good treatment shows in the way their employees treat their customers. What is Employee Experience Anyway? Employee experience is not just about HR, it’s not about your company branding touting what a great place your company is to work, and it’s not just about how many employees are engage socially and support the brand. Employee experience is not about perks and it’s not about ping pong tables, free lunches, or the availability of nap pods in every corner. Employee experience is how companies create, develop, and nurture a culture that’s employee-centric. What sets them (employees) up for success? How are we giving them control of their careers, helping them set and achieve goals, learn, grow, and thrive in the workplace? In a competitive job market, employees are shopping for the workplace culture and the employee experiences that are a fit for them. It’s a bit of a ‘what have you done for me lately’ ‘what can you do for me now, and in the future’ mindset, and that’s exactly why a culture that focuses on employee experience is so critical. Happy, satisfied, challenged, learning, growing employees stay around. They are happy in their jobs, and it shows. And that happiness translates to a company that provides great customer experience as well—it’s inevitable. How Engaged Are U.S. Employees? From statistics linking employee experience to customer experience, data shows that only 31.5 percent of employees in the U.S. report they are engaged in their work. That leaves just under 70 percent reporting they aren’t at all engaged. That data point should be an eye-opener for leaders, as a lack of employee engagement can, without question, impact a company’s bottom line. Companies with a highly engaged workforce report experiencing a 19.2 percent growth in operating income over a 12-month period. And it’s no wonder! By investing in comprehensive training programs, mentoring, and helping employees with developing skills and expertise, companies are investing in employee engagement. As mentioned above, higher engagement can result in higher job satisfaction, increased productivity, improved employee retention, as well as increased customer satisfaction. And it pays off. According to the Association for Talent Development (ATD), companies that invest in employee development see a higher income per employee of 218%. Key findings from Gartner, state that “Customer Experience (CX) is the new marketing battlefront.” And from the statistics linking employee experience with customer experience, almost 90 percent of companies expect to compete on customer experience primarily. But instead of focusing on improving overall customer experience, the main competitive differentiator will come from focusing on and improving each part of the buyer journey and customer experience. And of course, employee experience plays a role there, and companies with highly engaged employees reap the benefits of that. Research used in the compilation of the below infographic reports that 79 percent of employees at companies with above-average customer experience are highly engaged in their jobs, compared to 49 percent of employees at companies with average or below-average customer experience scores. Yet another data point that reinforces what is linking employee experience to customer experience. Business units with employee engagement and connection scores in the top 25 percent had 10 percent stronger customer metrics. Once again, happy employees equals happy customers. Higher engagement and connection with employees equals employees being more enthusiastic about their jobs. The opposite can be true as well—satisfied customers can play a role in increasing employee engagement. Highlighting positive customer experiences can give value and purpose to an employee’s work, positively impacting motivation and productivity. Our final observation from the statistics linking employee experience to customer experience is that companies that invest in employee experience are four times more profitable than those that don’t. With figures like that, corporate priority on employee experience is a no-brainer. Building on employee experience can increase a business’s competitive advantage, sustain and fuel growth, increase employee satisfaction, help attract and recruit top talent, and positively impact employee retention. 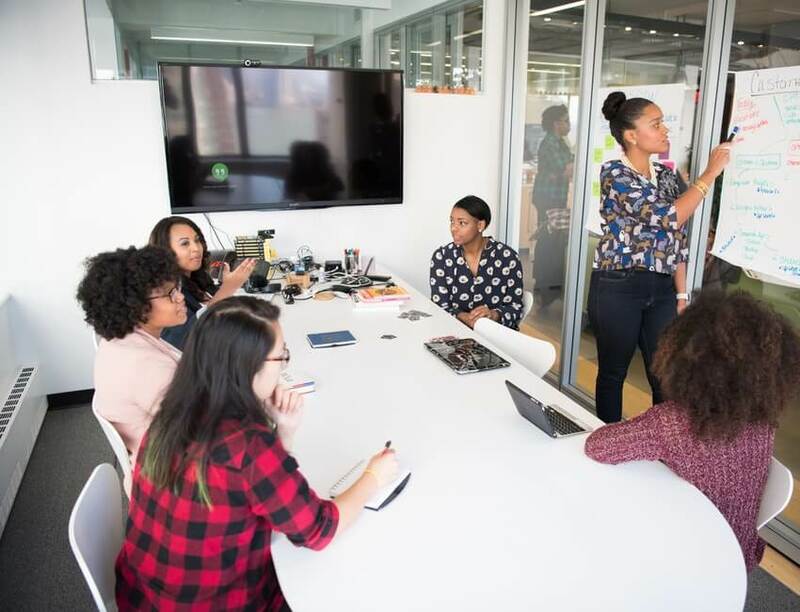 With the HR landscape in the midst of disruption, employee experience is not a new HR buzzword or a passing phase, nor is employee experience something that’s limited to an HR concern. Employee experience impacts the organization as a whole, and it’s something that senior leadership must embrace, support, and drive. We aren’t who we say we are, we are what we show we are. And that relates to corporations large and small as much as it does to individuals, don’t you think?